Schematic is a communicological technique that facilitates the construction of schemas: abstract and simplified representations of a phenomenon, a structure or a process in an almost simultaneous and synchronic manner, with no images and minimal use of text, applying synthesis and intelligibility for the purpose of communication. For Joan Costa a schema "is a graphical visualization, a logical transposition of data and abstract phenomena of reality that are not naturally accessible to the bare eye and many of them are not even of visual nature. Schemas represent the new field of information production to transmit knowledge, which cannot be transferred through words or images. Hence the specificity of schematic language” (Costa 1998). He also emphasizes that Schematic is a Third Language that in the midst of Information Society allows together with Image and Text to visualize: making the invisible visible, enabling visual representations of things that due to their level of abstraction or complex qualities are not directly accessible through perception and self-representations that are characteristic of languages of Image and / or conceptualization, stories, explanations, classifications, signs and words, etc., provided by Written Language. 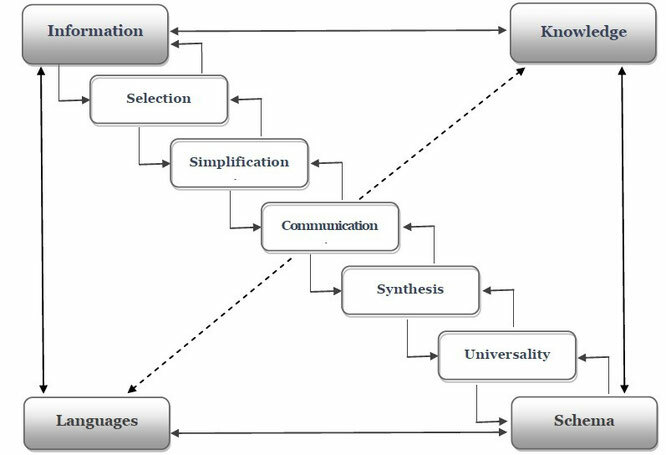 Communication: the Visualist decides which visual variables, typologies and graphical tools, and text elements will favour the schematic synthesis. Universality: the Schema must be easy to read and accessible to multiple and diverse audiences and modes of observation. It is a key step to ensure that schematization facilitates visualization in the terms prescribed by the Schematic. New information, image and communication technologies are constantly changing the forms of organizing information and its inclusion as knowledge in the center of contemporary social organization. In this context, processing increasingly large volumes of information becomes a strategic task for which techniques such as Schematic are essential. Applications: Building Diagrams, Cartograms, Histograms, Organizational, sociograms, Planners, Perts, Utility bill, maps, diagrams, networks, schedules, etc. Flow Charts.